There’s something inherently romantic about sleeping under the stars. The sounds, the setting, the vast, carpeted sky. But camping can also bring tinned food, sketchy public restrooms and a major bug factor. Thankfully there is a host of high-end properties around the world that offer all the adventure to set your heart aflutter and all the pampering to make your honeymoon dreams come true. From Australia to Zimbabwe, here’s a list of our favorite spots that offer the opportunity to reconnect with nature — without sacrificing upscale amenities (think oversized copper bathtubs) and service (like a “camping butler” to set-up s’mores roasts). Considered by many travel connoisseurs to be the most unique Four Seasons property, this tented resort sits in a lush, hidden-away part of Northern Thailand, in the so-called Golden Triangle that borders southern Burma and western Laos. 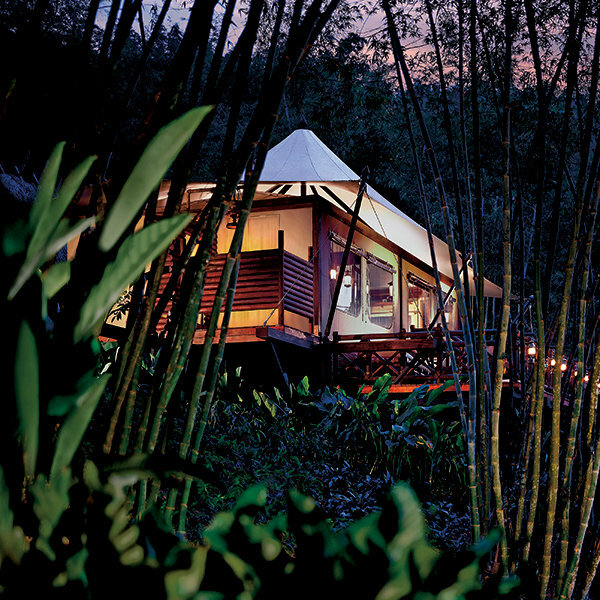 The tents: Spread out over different levels of bamboo jungle, the 15 deluxe tents each feature open floor plans with hammered copper tubs-for-two, outdoor rainfall showers, private decks, WiFi and elegant furnishings. Views vary, and some of the tents are a walk uphill from the main camp area, along stone steps and rope bridges and aren’t accessible by vehicle. The activities: The property is home to an on-site elephant sanctuary, and all stays include a half-day “training camp,” during which guests will don traditional mahout (elephant trainer) outfits, learn simple commands and even how to bathe the animals — and then take an unforgettable elephantback ride through the jungle. (Sunrise treks are also available, and from time to time, some smaller pachyderms from a nearby elephant reserve make appearances at the main dining pavilion for prime petting and photo ops.) There are also boat rides down the Mekong River, day trips to the museums and temples of nearby Chiang Sen and the intensive Jungle Gym workout, which includes a hike, run and weights session. Or just hang out by the freeform riverside pool, grab a cocktail in the panoramic Burma Bar and enjoy a Thai herbal massage in the spa tent. Honeymoon highlights: Start the day with a sunrise elephant ride, float down the Mekong on a bamboo raft (accompanied by a bottle of bubbly) in the afternoon, or pick up some kitchen tips with a class in Thai, Laotian and Burmese cooking, followed by a private candlelit dinner (room rates start at $2,080 per night for two and include meals, house wine and beer, mini-bar, WiFi, round-trip airport transfers, one half-day elephant experience, a spa treatment per person per day, a long-tail boat ride and Golden Triangle day trip. Two-night minimum; fourseasons.com). Dubbed Australia’s “Red Center,” Uluru is home to some of the continent’s most iconic tourist sites and some of its most spiritual spots. Set in the rugged outback of the Northern Territory, the Uluru-Kata Tjuta National Park spreads out over 311,000 acres, and houses both Uluru — one of the world’s largest natural monoliths, also known as Ayers Rock — and the natural red domes of Kata Tjuta, AKA The Olgas. Together, both natural wonders are part of an area rich in Aboriginal culture and sacred traditions. The town consists of a couple of hotels, a few shops, and — set a drive away from the others, overlooking the monolith Uluru — the magical Longitude 131°. 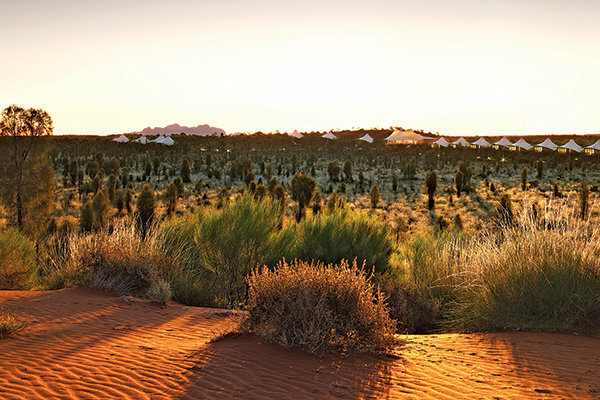 The tents: Named for its navigational position, Longitude 131° features 15 supersized luxury tents, with peaked white roofs, a mix of contemporary and traditional furnishings and floor-to-ceiling windows with views of either the sunrise or sunset and the red-rock Uluru monolith. Perks include iPads, WiFi, stylish bathrooms with deluxe bathrobes, and plush king beds. There are plans to add three new honeymoon tents and upgrade all tents with outdoor lounges and fireplaces in late 2014. The activities: Longitude requires a minimum two-night stay, and with good reason: You’ll need that amount of time to enjoy all that the resort offers. A three-night package typically features a sunset tour of Uluru and Kantju Gorge; excursions to Kata Tjuta and Walpa Gorge; a sunrise walk around the monolith and a trip to the Culture Center. There are also visits to local galleries and townships. All tours have touches like canapés and cocktails during evening walks. In between tours, relax around the pool, hang out in the main Dune House lodge (with a bar and library of books, movies and games) or book a spa service. Honeymoon highlights: All itineraries feature a dinner under the stars. Honeymooners can up the ante by booking upgraded experiences like helicopter flights, camel rides through the red sand dunes or Harley-Davidson rides across the desert (room rates start at $1,100 per person, per night and include meals and drinks, signature activities and airport transfers; longitude131.com.au). Set on a private reserve near the town of Victoria Falls — bordered by the Masuwe River and with views of the Zambezi gorges and the tops of the Falls misting in the distance — this charming spot is not your typical African safari camp. Here, guests enjoy easy access to the spectacular Victoria Falls, shopping and dining in town and area adventure activities, as well as interactive on-site animal experiences. The tents: Twelve cushy tents feature fluffy beds, colonial-chic furnishings, indoor and outdoor showers, private plunge pools and decks overlooking the gorge. There are no phones, but each tent has a walkie if you need to contact the staff. WiFi is available in the main tent, which also houses a living room, the bar, a library and seating for meals. 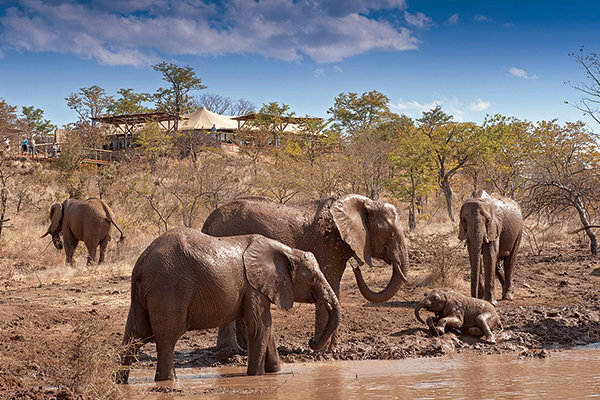 The activities: The Elephant Camp is operated by Wild Horizons, a travel outfitter, that also oversees an adjacent elephant sanctuary, and all guests get the opportunity to “meet” the resident pachyderms. But it’s also worth signing up for one of the elephant ride sessions, which includes time to interact with the animals during a gorgeous ride through the bush and over rivers. The Camp is also home to a resident cheetah, and guests can take an early-morning or late-afternoon bush walk with him, too. It’s also the perfect base for visiting Victoria Falls. Private guided tours, with stops in town at the market, can be arranged — as can adventures like rafting or bungee jumping. In the evenings, the staff — led by the vivacious manager/your instant best friend, Jonathan Ellway — will chat about your day over cocktails and gourmet dinners. Honeymoon highlights: Splurge on a helicopter ride over the Falls to get a true sense of its magnificent scope. 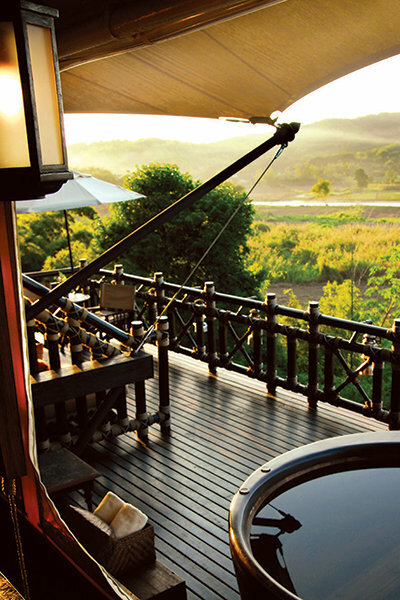 Then end the day with a private in-tent massage or a romantic dip in your plunge pool, watching the sun set over the gorge (room rates start at $900 per person, per night and include meals and drinks and an elephant meet-and-greet. Due to the logistics of a safari vacation, it’s best to book such an experience through an expert Africa touring specialist like Extraordinary Journeys, who can help coordinate all transfers; ejafrica.com). You’ll be in the heart of Lewis and Clark country at this 37,000-acre Montana working ranch-resort, set along 10 miles of the Blackfoot River (made even more famous in the Brad Pitt-Robert Redford movie, A River Runs Through It). Legend has it that in 1806, explorer Meriwether Lewis climbed Sentinel Rock (part of what’s now the Resort at Paws Up property and the spot where they host rappelling) in search of the Marias River. Since then, the grounds have housed everything from gold mining claims and homesteads to sheep and cattle ranches. Accommodations are spread out over the acreage, and include both upscale cabins and luxury tents. 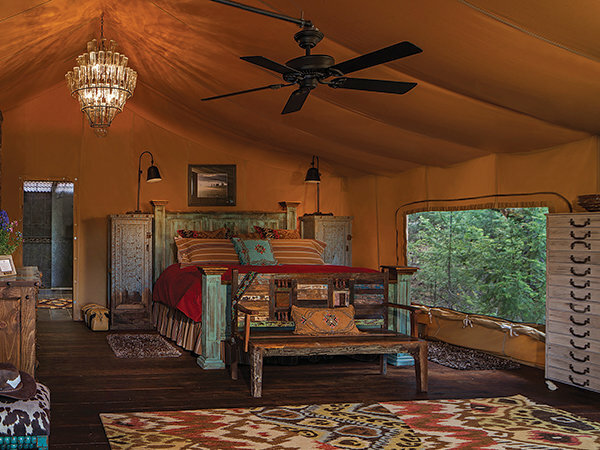 The tents: Paws Up offers five different glamping areas, each with six one- or two-bedroom tents. 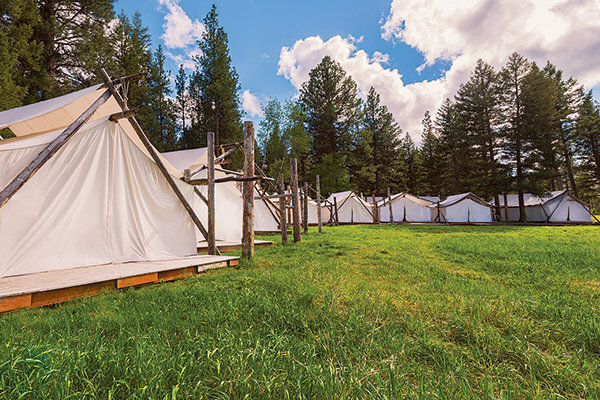 Each campground features cushy digs (outfitted with bathrooms, Western-chic furniture and feather-topped beds) and amenities like in-camp dining pavilions, fireplace lounges and camping butlers. The Cliffside Camp — set, as the name says, atop a cliff with views of the Blackfoot River rapids — has two honeymoon tents, each with wooden decks and a copper tub at the foot of the big beds. You’ll want to spend at least one afternoon snuggling in the Adirondack chairs made for two. Another romantic spot is Pinnacle Camp’s Tango Point Honeymoon Tent, located on a bluff overlooking the intersection of Blackfoot River and Elk’s Creek and boasting both jetted and claw-foot tubs. The activities: With the Paws Up’s vast acreage, which includes 25 miles of on-site hiking trails, plus the easy access to the nearby, 1.5 million-acre Bob Marshall Wilderness Reserve, there are countless outdoor activities available. Head out on a guided wildlife drive to spot bald eagles, whitetail deer, bears and more; try your hand at clay-pigeon shooting or ATV-driving. On the river there is white-water rafting and fly-fishing, in addition to kayaking and canoeing at nearby waterways. But perhaps the most exciting activity is the cattle drive, where guests atop horseback wrangle and cut a herd of cattle across sage-scrubbed fields. Honeymoon highlights: Tucked at the edge of a pine meadow, the resort’s Spa Town is a colony of breezy white treatment tents, each with private baths, heated massage tables; pasture views and a soundtrack of the nearby brook. Enjoy the Star Light, Star Bright Twilight Couple’s Massage — performed in a candlelit tent as the sun sets — or opt for a latenight, pre-bedtime Sweet Dreams Couples Massage in the privacy of your tent (room rates start at $1,275 and include all meals, most activities, airport transfers and on-property transportation; pawsup.com). Alex Walker’s Serian Tanzanian tented camp moves locations according to the region’s seasonal Great Migration, so guests are always in the best position to spot wildlife as the herds (and their predators) make their way across the fabled Serengeti. 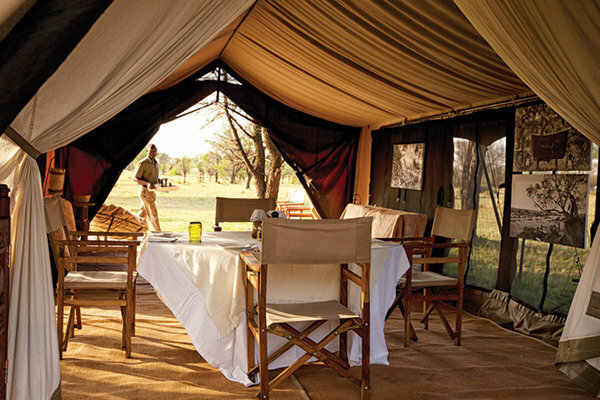 From July to mid-October, the camp sits in a hidden valley of the Wogakuria near the Lamai Wedge, where rolling savannahs and fig tree groves come together north of the Mara River. 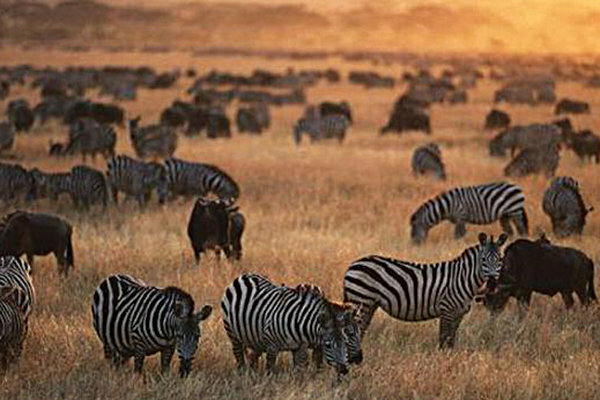 Between mid-December and April, the camp is at the southern border of the sprawling Serengeti National Park. The tents: The eight to 10 tents are designed in classic safari style, with canvas walls, soft floor rugs, colonial-inspired furnishings and the largest and plushest beds around. 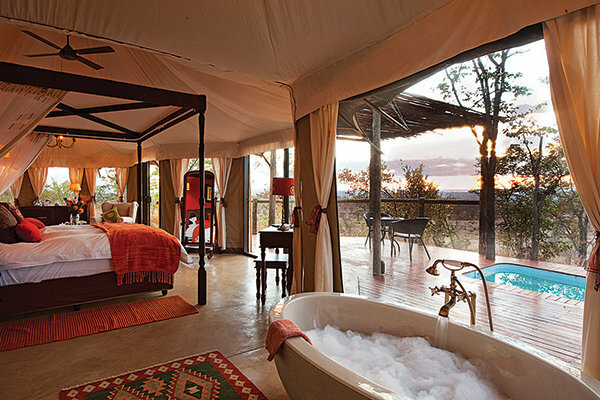 Tents have adjoining “bush bathrooms,” with plumbing for the toilets and heated buckets of water for the showers. Telephone and WiFi service is reserved for emergencies, so guests get the chance to completely disconnect. The activities: A special amenity of Serian is the fact that all guests enjoy private game drives with a guide/driver and spotter. The benefit is being able to schedule outings according to your whim. In the northern camp, you’ll cross panoramic riverbanks, open savannah swathes and rocky outcroppings. The region is rich with wildlife — enormous herds of wildebeest, zebra and giraffes, along with in-pursuit lions, cheetah and leopards, hungry crocodiles and — if you’re lucky — the elusive black rhino. There are also opportunities to take walking safaris through the bush with Alex himself. At Serengeti South, the camp is in the south during the wildebeest calving season, so along with the mega-herds and predators, you’ll spot newborns. Guests here also have the opportunity to meet with the indigenous Hadza people. Sundowners, chats around the campfire with hosts Gerard, Belinda, Alex and Robin, and gathering with other guests for gourmet meals in the main tent — around a massive table — are standard at both camps. 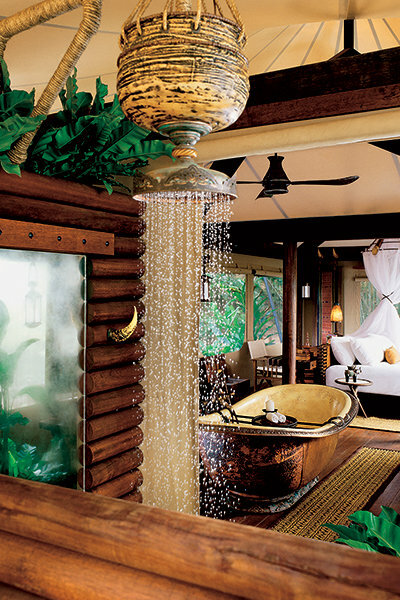 Honeymoon highlights: Given the camps’ small size and emphasis on personal attention, privacy and romance are key. In fact, a secluded honeymoon section located a bit further from the other guests has recently been arranged. Couples enjoy only-in-Africa experiences like a sunset bath in an outdoor copper tub with sundowners, as well as private tented dinners (room rates start at $800 per person, and are all-inclusive. A per-day park fee is additional; ejafrica.com).